﻿The field of viral immunology has been fortunate to be advanced by the seminal contributions made by two close buddies - Barry Rouse and Bill Narayan - whose names that are synonymous with pioneers and whose work revolutionized the field, laying the cornerstone of today’s discoveries. Both veterinarians, they initiated their graduate careers in Guelph, Canada, working on avian flu, now known to be H5N1, under the mentorship of Gerhard Lang, wearing him out (he accepted no more graduate students), nurturing their friendship, and helping to develop their passion for science and their unmatched wit. Nothing could therefore be more befitting than for Barry, the galvanizing figure in immunology research and a true thought leader, to be chosen as the recipient of the ISNV 2015 Bill Narayan Lectureship. 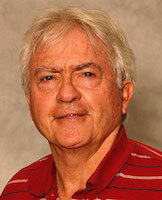 Barry is the Lindsay Young Distinguished Professor at the University of Tennessee in the Department of Microbiology. Born and raised as a farm boy in England, Barry developed a fascination for natural sciences from an early age, and this attraction led him to pursue a career in veterinary sciences. He attended the University of Bristol for undergraduate work in Veterinary Medicine, followed by his move across the Atlantic to the University of Guelph, Canada, where he received both Masters and Doctorate degrees in Virology and Immunology. His deep-rooted quest for science and the prestigious Medical Research Council fellowship took him across the globe to Melbourne, Australia, to pursue post-doctoral work in the field of cellular immunology. Barry occupied senior faculty and research positions at the University of Saskatchewan and since 1977 has been at the University of Tennessee where he rose through the ranks to become a Distinguished Professor. The quest for knowledge has been the mantra of Barry's life, which took him again to the University of Bristol to receive the degree of Doctor of Science in 1997. Barry has a long and commendable career in the area of infectious diseases with a focus on immunopathology. His deep sense of social responsibility and his passion for making a worthwhile contribution to benefit mankind are reflected in his choice of research topics in a career spanning about 4 decades - the study of herpes simplex virus infection (HSV) and how it offsets multiple events culminating into blinding lesion herpes stromal keratitis (SK) in mice. The goal of his research has been to both develop successful vaccine strategies to combat HSV infection and, more importantly, to understand how HSV causes damage to vital organs such as the eye and the nervous system. Among his many works, Barry has contributed significantly to studies of host innate and adaptive immune responses, specifically the T cells responsible for immunity as well as those involved in orchestrating tissue injury in response to HSV. Barry's scientific achievements are stellar. His pioneering work on the role of regulatory T cells (T regs) in viral infections (especially how they participate in modulating the severity of immunopathological responses, typically those that occur in the corneal stroma following HSV infection of the eye) has been groundbreaking in the field. Formative work from his lab helped to define the role of a non-specific inflammatory cell, the neutrophil, as a causative agent of tissue damage. Pioneering work from his group was the first to recognize the critical role for corneal neovascularization during SK pathogenesis, with identification of several novel angiogenic factors mediating this process. Not only has Barry been on the forefront of SK research, but his mission has also been to develop therapeutic strategies aimed at controlling neovascularization and promoting lesion resolution, with the ultimate goal of effectively treating this debilitating condition. He has been relentless in this pursuit. His creative approaches at combating neovascularization have included modulation of T reg numbers and activity, manipulation of host factors such as Galectin 9 and Galectin 1, and development of adjunctive supplemental treatments such as derivatives of omega-3 polyunsaturated fatty acids, including synthetic resolvins and protectins. Barry's quest and zeal for science and his curiosity for keeping up with the latest trends includes a new interest in the role of a recently emerging class of small non-coding RNAs - microRNAs - in SK pathogenesis and resolution. He has a truly exemplary trait of staying abreast with the latest trends in the field!! Barry has been the recipient of several awards and accolades and continues to be scientifically prolific. His eyes still light up like a kid in a candy store when talking about science. He is to be commended for building and maintaining his productive research program that spans a career of over 40 years, particularly in a non-medical school environment where no one could complement his research efforts. He continues to maintain his research program - 3 R01s for about 25 years and two ongoing grants with one in its 33rd year!! During his distinguished career, he has trained countless mentees, most of whom have gone on make successful careers in the field. For those who don't know him, Barry is an extrovert with a sharp wit and a generous measure of his "brit" humor that is the highlight of his presentations. It is his humor-dotted presentations that get the science across succinctly, concisely, and clearly while making it more memorable. It is both a pleasure and a privilege for ISNV to bestow this year's Bill Narayan lectureship to Dr. Barry Rouse. Bill couldn't have been happier! Here is to you Barry - a mentor, a guide, and a wonderful friend!